At the end of June I began work on another revision of my novel to incorporate what I learned at UW Madison’s Write-by-the-Lake in Laurie Scheer’s class, Mastering Your Genre. I highly recommend this class for everyone working on a novel or screenplay, but you could also read Laurie’s book The Writer’s Advantage: a Toolkit for Mastering Your Genre. I highly recommend it. The research you do will open your eyes to what has been done before and how you can offer something new in your genre. My research led to my learning a number of lessons not only in writing but also about life. One of those lessons involves perspective. I’m a slow writer. Mostly when I revise, I weigh the words and images I put on the page, but even when I’m composing my first draft I struggle with a number of problems, chiefly point of view. Christine DeSmet, best-selling author and writing teacher extraordinaire, read and critiqued my entire first draft, God bless her. I don’t know how she could stand it! I can’t tell you how often she put in her notes, “You’ve switched point of view here.” It must have been vexing. I was slow to see the difference, I think, because I was in l love with the writing process, rather than trying to see from a character’s point of view and only that character’s point of view. Now I understand whose point of view carries a scene and why and how not to switch point of view even as I write my first drafts. The work I’ve been doing lately has to do with point of view, but it goes deeper than I thought before. It involves seeing the world of my story from the perspective of each character, and it is slow going. Since I delved more deeply into the genre of my book, I realized that my main character wasn’t strong enough. She needed to carry the story much more than she had before. That meant I had to understand her world as she did, to understand and love and hate the people and places she does. I had to feel what her home means to her, what falling in love for the first time feels like, what feeling betrayed feels like, all those things from her point of view, her perspective. I’ve had to imagine what life would have been like when being unmarried at 19 dubbed you a spinster, when wearing trousers rather than a corset and dress made you provocative and unladylike, when the only prospects of survival for a young lady were marriage or inheriting a large amount of money. I’ve also imagined what living at a time when the world as you knew it had collapsed and the societal structure was either non-existent or changed so as to be unrecognizable. You see my book is set in 1869 Charleston, South Carolina, so I try to delve into what society might have been like then, what relationships between women might have been like, both between white women and between white and African American women. To see from Josiah’s perspective, I’ve tried to understand PTSD (post traumatic stress disorder) and the struggle to live life normally after witnessing the unspeakable horrors of war. Back then PTSD was called “soldier’s heart” or “nostalgia.” I’ve tried to inhabit that world as much as possible, but not until I took Laurie’s class did I feel I could crawl beneath my characters’ skins and see their world from their perspectives. Often I don’t take the time to look at life from a new perspective. I drive the same route to work each day. I travel the same path when I go for my morning runs with Stella. I drink the same basic smoothie recipe on a daily basis. To change that, something must jar me out of my routine. That’s what this class did for me. Today when I was out for my run, I decided to try something different. 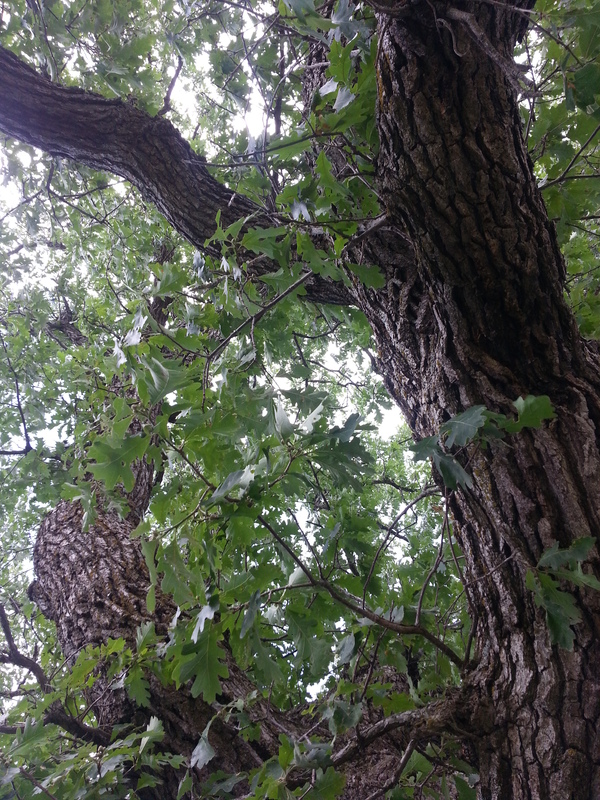 In my book my main character Faith has a special oak tree which she has considered hers since she was a child. It is a live oak, a big one that I imagine looks like the Angel Oak on John’s Island in South Carolina. She goes there when she needs to think or be alone. 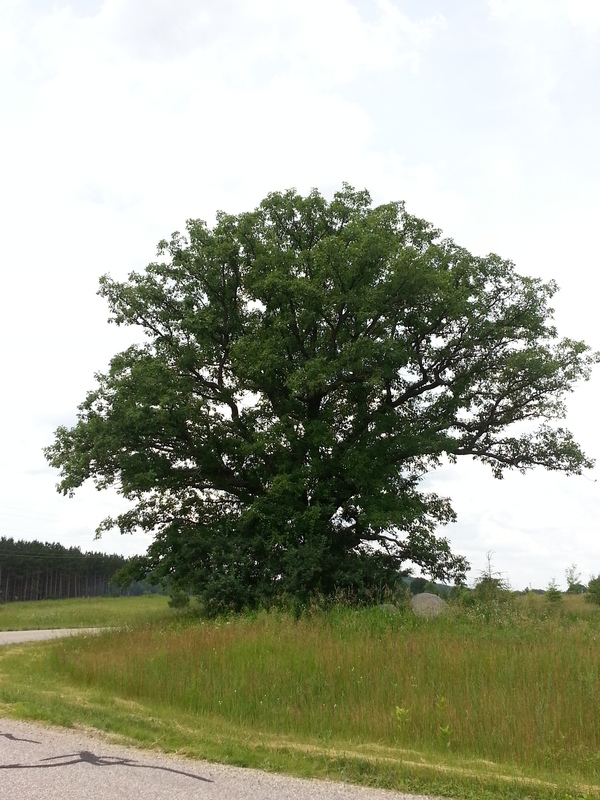 I don’t have a special tree where I go to think, but a very old white oak tree stands in front of my house. At one time I imagine it might have been someone’s special tree because it survived standing in the middle of a farm field rather than being chopped down for fire wood. Today when I was walking back home after my run, I decided to include a picture of this tree in this post. That is it to the left. Since I’ve been thinking of perspective, however, I wanted to do something else, too. I wanted to climb this tree to get Faith’s perspective from inside a tree. As a child I climbed trees, but that was a long time ago. I climbed up to the first limb, but I chickened out going any higher. My middle name is not Grace for a reason. One day I still might climb it, but not on the spur of the moment when my husband is not around to rescue me if I can’t get down. So I did what I think is the next best thing. 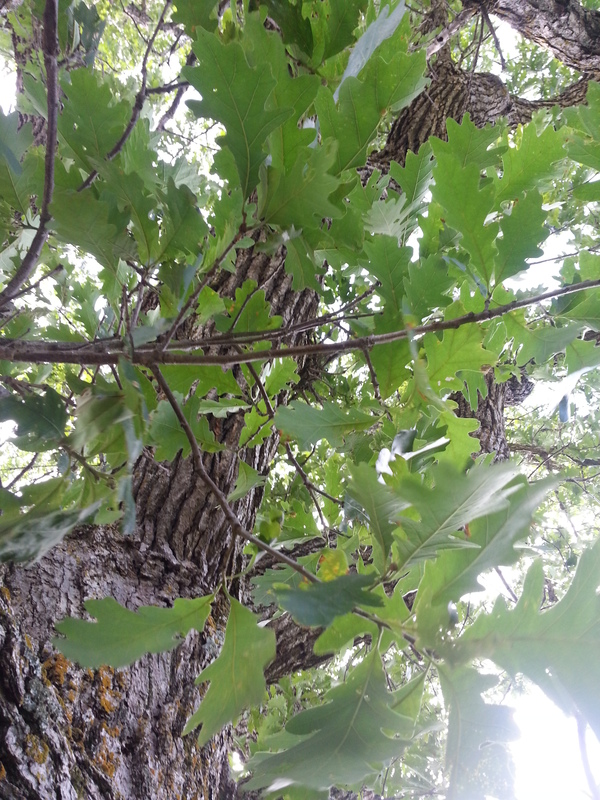 I took several pictures from beneath the tree looking up into the branches as though I were about to climb it. Below you’ll see what that looks like. Quite a different feel from the one above, wouldn’t you say? Before this revision of my book, I was looking at the world of my story as I always had, from afar. I was looking AT it rather than being inside the story looking out from it. Before I was telling the story, reporting it rather than inhabiting it with my characters. To understand my characters and what they see and feel, I’ve learned I must see from the perspective of each of them . They will show me what is important to them. I must be present in the story with them and feel what they do, see what they do, love and hate what they do. I must be with them in their world rather than looking at it from afar.